A Hawaiian musical theater re-telling of ANNIE, but set in Hilo. 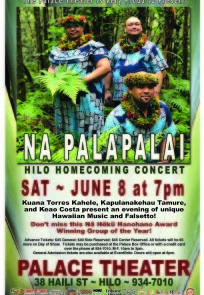 Multi-award-winning supergroup Na Palapalai, with band members Kuana Torres Kahele, Kapulanakehau Tamure, and Keao Costa, will reunite for a special concert. All ticket prices increase by $5 on the day of the show. Doors open at 6:00pm. 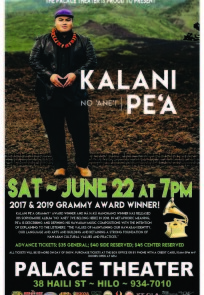 Tickets available at the Palace Theater Box Office window or over the phone with a credit card at 808-934-7010. General Admission Tickets available ONLINE!